You may recall that, while in Paris this June, we dined at a little place called Au Bon Couscous near Notre Dame. We enjoyed that meal so much that we hoped to figure out how to recreate it. 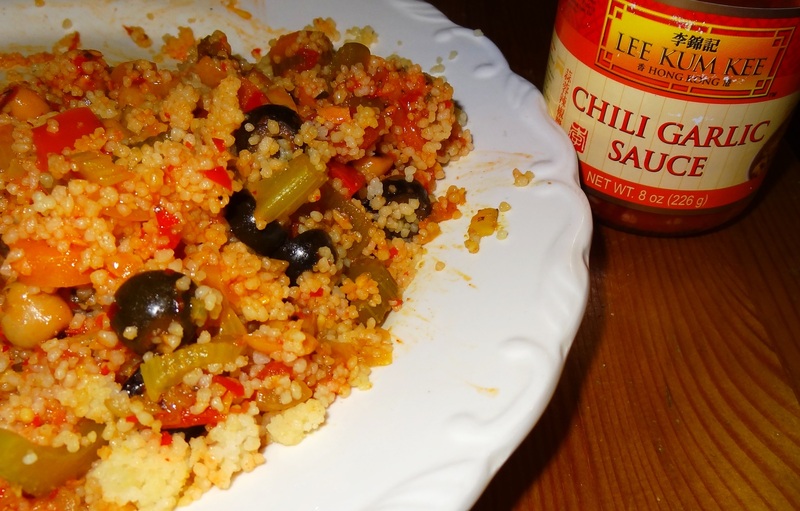 I got some plain couscous from the bulk section at Sprouts and looked up a Moroccan Stew to accompany it. I still think the recipe needs some tweaking (theirs was more broth and a little thicker), but this is pretty damn close. In a good size Dutch oven (I used my Martha Stewart cast iron casserole pot) fry the onion, garlic, carrot, pepper and celery in the olive oil for 1 to 2 minutes. Add all the dry spices and stir-fry this for 1 minute more. To this add the stock and the tomatoes; simmer for 10-15 minutes. Then add the chickpeas, zucchini and the olives, bring to a simmer, cover and cook until the zucchini is cooked, probably another 10-15 minutes. Add lemon juice, taste, and serve. I let mine simmer much longer than this suggests, hoping that the flavors would meld a little better. Plus, Eric wasn’t home yet, so I wanted to keep it warm. We spooned in a little Lee Kum Kee brand Chili Garlic Sauce to taste when we served ourselves and it added some yummy spiciness to the dish. This would be a great dish for the cold months, but maybe not the best to have right now while we are having a triple-digit heat wave in Southern California. It is really simple to make and yields a lot, but would be easy to double and freeze for the future. I imagine that this would be a good dish to serve many people because they could choose the portion sizes of each ingredient to their individual taste. 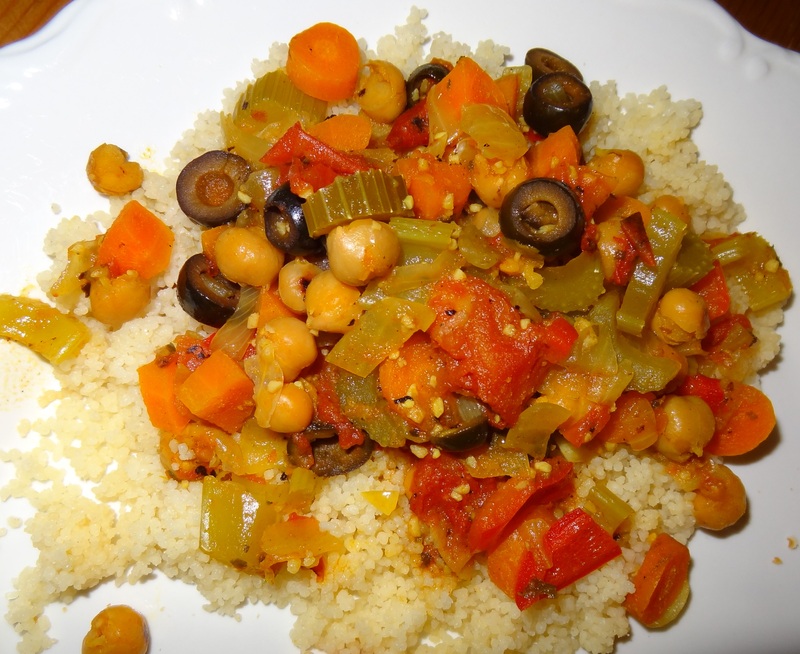 Posted in Dinner, Vegan Recipes and tagged couscous, cruelty-free, Moroccan, recipe, stew, vegan, vegetarian. Bookmark the permalink. 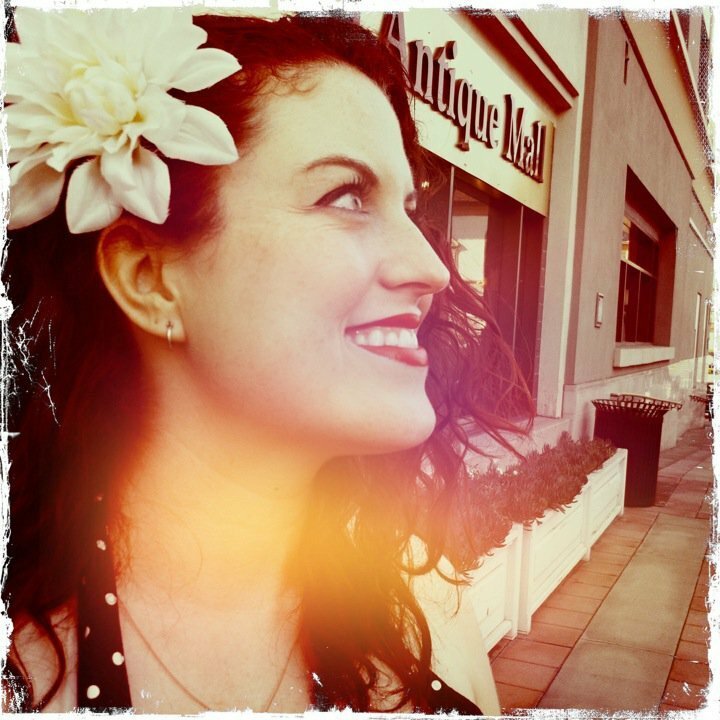 I blog to document my experience transitioning to a vegan lifestyle. 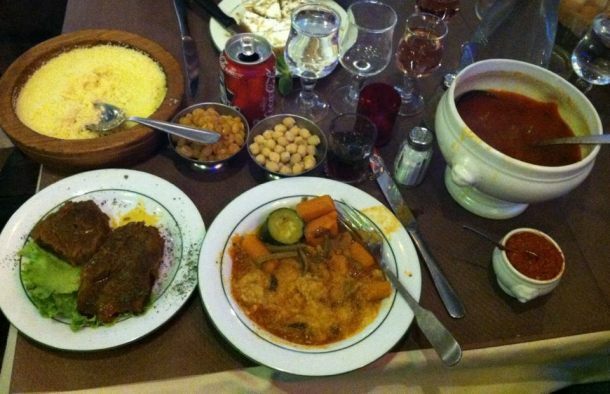 I will keep that couscous place in mind when visiting Paris!